EMPTY NEST is riveting! So much so, I recommend setting aside a block of time to read it start to finish–you won’t want to stop before the end. The pace is quick, the characters are well-developed, and the plot has many twists and turns. What a great read from a great author. Thinking about the Brit-coms I adore, this kind of reminds me of “To the Manor Born” (with Penelope Keith). I could totally see the “Birds of a Feather Mysteries” becoming a mini-series on the BBC. If you like cozy mysteries in small English towns, you can’t go wrong with either of Marty Wingate’s series. It ‘s a well-written and engaging story with many twists and surprises. I also loved the setting, a picturesque town in the UK. I love how the author is able to transport readers into the life on a British estate, and to be able to experience the British countryside through her words. If you love Laura Childs, Ellery Adams, or Jenn McKinlay, don’t miss Marty Wingate’s charming Birds of a Feather series! In Empty Nest, Julia Lanchester’s life is interrupted by a murder most foul—and a killer who’s watching her like a hawk. 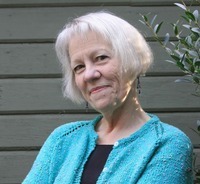 Marty Wingate is the author of two previous Potting Shed mysteries, The Garden Plot and The Red Book of Primrose House. Her new Birds of a Feather Mystery series debuted with The Rhyme of the Magpie. Wingate is a regular contributor to Country Gardens and other magazines. She also leads gardening tours throughout England, Scotland, Ireland, France, and North America. More Potting Shed and Birds of a Feather mysteries are planned. Marty Wingate is a “new to me” author … thank you for the introduction. The Birds of a Feather Mystery series sounds great. Another great read! Thank you for sharing. I very much enjoyed this book. The author writes in a way that just captures me and makes me comfortable while I go on the book adventure. I had to look twice at the cover. I wasn’t sure at first if I really saw the skull in the fire. I really like the cover. The story sounds interesting. And, I’m sure I’ll love the other two as well. I’ve been eyeing this series. It sounds great.